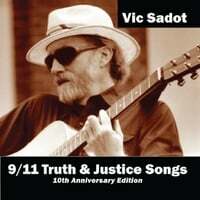 Vic Sadot is a singer-songwriter and social justice activist in Berkeley, California with a fourth CD released at CD Baby in December 2016. “Truth Troubadour” is the most acoustic and reflective CD of the four that Vic Sadot has listed at CD Baby. http://www.cdbaby.com/cd/vicsadot4 On 9/11/11 he released a new CD titled "9/11 Truth and Justice Songs" which is available at CD Baby: www.cdbaby.com/cd/vicsadot3 Earlier CD's still there are "Comin' Home", the Cajun/Zydeco 1997 release, and "Broadsides & Retrospectives", the best of 25 years of Vic Sadot original folk-rock & blues 2005 release. Vic can be followed at Twitter, YouTube, and Blogspot as "Truth Troubadour". Vic writes songs in the "Broadside Balladeer" tradition of Phil Ochs, Woody Guthrie, Pete Seeger, Malvina Reynolds, Odetta, Tom Paxton, Ledbelly, and Len Chandler. He has music videos posted at YouTube, Daily Motion, Vimeo, and other video sharing sites.